It’s not what to do, it’s when to do it and how will you choose what to do. Muskogee is full of things to do, from the sunny landscape of Honor Heights Park to the cool darkness of the historic Roxy Theater. Native American art from the likes of Willard Stone and Jerome Tiger, cardboard regattas, Azalea festival events, a Renaissance Festival, bull riding championships, G-Fest – our three day music festival, mud volleyball tournaments, the Katy Shopping district on south Main St., and much, much more. 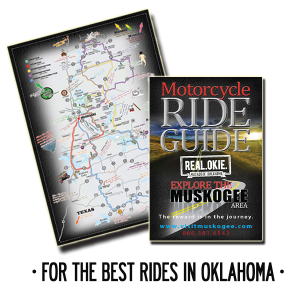 Whether you prefer exploring the great outdoors at one of the nearby lakes or rivers, or a stroll through one of our museums or stores, Muskogee has something for everyone. After all, where else can you find a real WWII submarine and a Medieval castle in the same town? Oklahoma’s best antique shopping can be found right here in Muskogee. There are treasures abound in numerous shops, where you can find that unique something you’ve been seeking. But it doesn’t just stop at antiques, you can find gifts, art, home accents and much more! Bringing quality, affordable seasonal and everyday home decor, women’s accessories and much more to Muskogee. The Festive Nest is here to provide you, your family and your nest everything it takes to love the place you’re in! Un-Earthed Treasure sells the adventure of finding that one of a kind Vintage, Antique or Artisan treasure. The Red Shed is a unique country shop located in the small town of Erin, Ontario that offers reclaimed/repurposed pieces of furniture and home decor, antiques, consignment pieces, barn finds and other homemade treasures. The Three River Museum Gift Shop offers a variety of items specific to the Muskogee area and history with lots of gifts for children and some great looking t-shirts. A unique shopping experience. A spacious showroom full of antiques and new furniture from over 40 brand names. Browse through fascinating antiques and furniture for the living room, dining room, office and more. Economy Pharmacy is a locally owned and operated pharmacy in Tulsa and Muskogee dedicated to personal, prompt and professional service tailored to meet our customer’s needs. A full service compounding pharmacy, we take pride in our ability to provide the highest level of personalized care to our customers that you can only get from a member in your community. An adorable collection of shops offering a wide array of antiques, collectibles and unique gifts. Open Tuesday through Friday, 9:00 a.m. to 5:00 p.m.
Open Saturday, 9:00 a.m. to 3:00 p.m. There are plenty of places to eat in Muskogee OK. Whether you’re looking for a succulent steak, piping hot pizza, or the deep aroma of fresh coffee, Muskogee has lots of excellent dining options to suit your taste. Be sure to check out Muskogee’s signature restaurants, where you’ll find the best Muskogee has to offer. Down-home, farm friendly dining makes Charlie’s Chicken a family favorite. Best known for their all white meat chicken chunks, this cafeteria-style eatery takes fast food to a higher level. Locals have made Charlie’s the most popular place for a country meal, finished off with home-style fruit cobblers. Though now a chain restaurant, with two locations in Muskogee, the original Charlie’s Chicken is located here. There are family activities and events abounding in Muskogee. Summer fun awaits at the River Country Family Water Park and the USS Batfish submarine satisfies the desire to explore throughout the year! The Papilion, open from Mother’s Day through Columbus Day, includes a seasonal teaching garden as well as the Georgia-Pacific Butterfly House. Tulips fill the garden in April in conjunction with the Azalea Festival. Throughout summer, the garden boasts a colorful array of flowers which attract native butterflies. The Georgia Pacific Butterfly House is a state-of-the-art enclosure allowing you to walk among free-flying butterflies and discover the amazing world of these glorious insects. Private reservations available for weddings, reunions, and special events. Step back in time to the 16th century with King Henry VIII, Margaret of Scotland, the Royal Court, jousters, jesters, jugglers, knights, magicians, musicians and minstrels. Over 500 costumed performers and artisans create the boisterous village of Castleton. Delight your tastebuds with the wonderful and unique foods of days gone by. Browse through more than 100 booths with one-of-a-kind handcrafted items. Bring the whole family and rent a costume to enjoy the full wonderment of a day filled with knights in shining armor, kings, queens and maidens fair. A multitude of exciting entertainments are on display including amusing real life chess games, jousting tournaments, thrilling acrobatic feats and more. Don’t miss the children’s realm featuring games and hands-on demonstrations which provide hours of fun, try your luck at the Ultimate Maze. Special events are held throughout the festival, including The Royal Luncheon, the Queen’s Tea and the King’s Smoker. Come visit the Castle of Muskogee and experience the time of the Renaissance with food, shows, crafts, gifts, and entertainment for the whole family. The stunning Honor Heights Park is just one of many beautiful parks here in Muskogee. Home to the famous Azalea Festival in the spring and the Garden of Lights during the holidays, Honor Heights Park is a unique destination. Another one is the Farmer’s Market, a trove for local produce and unique finds. And with three rivers and five lakes within an easy drive, you’ll find plenty of nature here in the capital of Okie Nation. From the renowned Native American art in the permanent collection of the Five Civilized Tribes Museum to the musical heritage of the Oklahoma Music Hall of Fame, you’ll find plenty of arts and entertainment here where the three rivers meet. Muskogee enjoys four distinct seasons and all the beauty that comes with them. Muskogee has an average of 222 sunny days per year.The high temperature here in July is typically 94, while the low in January is 27. That’s a lot of pretty days to enjoy. But even on the rainy days, Muskogee is a city full of character. Go Shopping through delightful little shops and tea rooms like The Market and our Main Street antique stores. And with the only downtown shopping mall in Oklahoma, you can spend an entire day meandering around downtown. More ideas for an ideal itinerary are below. Women’s Apparel, Accessories, Gifts & Home Decor. Exclusive Retailer of Magnolia Home Furnishings by Joanna Gaines! Offers amazing fresh fruits, vegetables, jams and jellies, made to order sandwiches and more all summer long. Located on the corners of Highways 69 & 51B. A large selection of boots, western wear, real cowboy hats and clothes for hard-workin’ people who still like to dress well. This shopping center houses many national retailers including: Best Buy, Ross Dress For Less, The Shoe Department, Petco, EasyHome, Dollar Tree, and others. A quality consignment store specializing in children and maternity clothes as well as baby items. Bella Mea’s offers a fabulous selection of ladies clothing, shoes and accessories in the latest fashions. You’re sure to find styles to fit your pleasure. Muskogee is home to rivers, lakes and camping sites that are fantastic for the whole family. Whether you are pulling a 5th wheel or driving a mobile home, Muskogee has the perfect spot for you. Enjoy Muskogee’s gorgeous colorful Azaleas as we celebrate the Azalea Festival in April. Every year, Muskogee’s Azalea Festival attracts over 300,000 visitors to Honor Heights Park, the 122-acre park features spectacular color throughout 40 acres of beautifully manicured gardens, highlighting over 30,000 azaleas as they flourish in 625 varieties. Roses, tulips, other flowers and gorgeous landscaping compliment the azaleas – an unforgettable impression to last a lifetime. Let us arrange a unique picnic at the USS Batfish and War Memorial Park for your group. Guests can tour a real submarine and hear stories from the heroes that served on the now dry-docked military vessel that sank three enemy submarines! Every weekend in May, Muskogee steps back in time to days of Old King Henry VIII with jousters, jugglers, minstrels, knights, and musicians as we celebrate this royal era at the Castle of Muskogee. Thirty beautifully hand-painted eight-foot guitars are scattered around town like jewels. Can you find them all? Hint: maps are available. “We still wave Ol’ Glory down at the court house”, a great place to take your group photo. Then head to the Muskogee Civic Center and see where the song was first recorded, you can even stand on the stage and see Muskogee from Merle Haggard’s point of view. The Muskogee area is rich in Native American history and culture. We celebrate this through the art and crafts at the Ataloa Lodge Museum at Bacone College and the Five Civilized Tribes Museum, where the Trail of Tears trek is remembered. Every fall the museum inducts some of Oklahoma’s most famous musicians that have been inside the spiral of American Music history. Beginning Thanksgiving night, you can drive through a winter celebration at the Garden of Lights in Honor Heights Park to see millions of twinkling lights strung carefully to enhance the natural beauty of the park. Then drive through the Christmas Kingdom, one of the world’s largest holiday inflatable displays.